AT GREAT HARVEST IN STILLWATER! Your friend gets $1 OFF their purchase. You get 2 extra credits in our Bread Rewards Program. 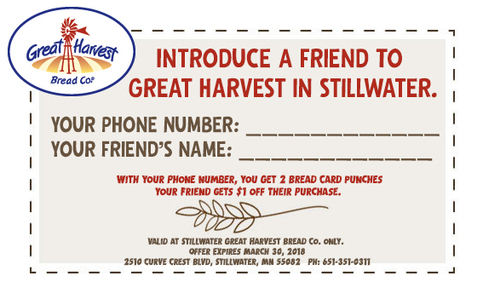 Coupon must be presented in the bakery, and your friend is encouraged to join our Bread Rewards Program. What could be better than introducing your friends to the best bread in the Saint Croix Valley? It's about spreading the word about health, nutrition and flavor. Thanks for helping us get the word out! We are truly grateful to you!